The Horiba SA-9600 series offers a lower cost-per-analysis alternative to competitive instruments, one that also provides faster results while not sacrificing accuracy. It uses the flowing-gas method, which determines the quantity of a gas (e.g. nitrogen/helium mixture) that adsorbs as a single layer of molecules, a so-called monomolecular layer, on the sample. Using this approach total surface area measurements can be rapidly made every six minutes, depending on the magnitude of the surface, with 10 samples analyses every hour being achievable in single point mode. The SA 9600 multi-point performance is also comparable to the much slower and more expensive static volumetric systems. What is more, the SA-9600 series is really fully automated, just ‘push and go’, and they all take care of themselves. First off detector baselines are zeroed, then high precision valves inject 1cm3 of nitrogen into the flow systems to calibrate the analysers. Then the sample cell is surrounded with liquid nitrogen in a bath, while the gas mixture is passed through the cell and nitrogen adsorbed onto the powder surface. Next the bath is lowered, the amount of desorbed nitrogen calculated and proportioned to the calibration signal to produce the sample surface area. The last part of the operation involves the division of the surface area by the sample weight to give the specific surface area in m2/g. 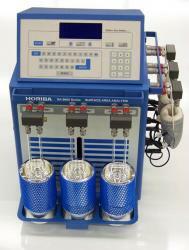 The SA-9603 analyser model has three-stations and thus can measure three samples simultaneously. It comes with an on-board computer, vacuum fluorescent display and integrated three-sample de-gas preparation station. Additional de-gas capacity is available via a dedicated SA-9660 three-sample prep station. The analyser will store up to 100 analyses and has a parallel output to furnish ASCII files or send serial output to LIMS or connect to a Remote PC.